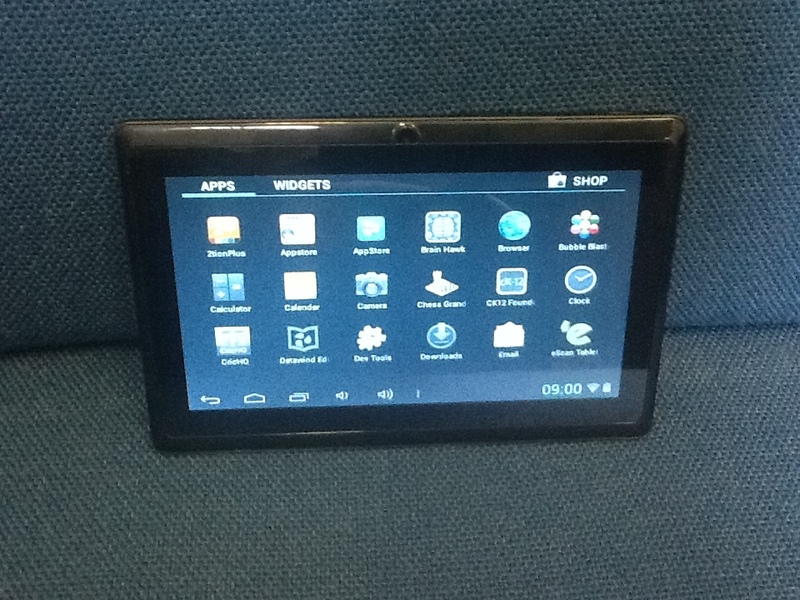 UbiSlate £30 tablet – the game changer? 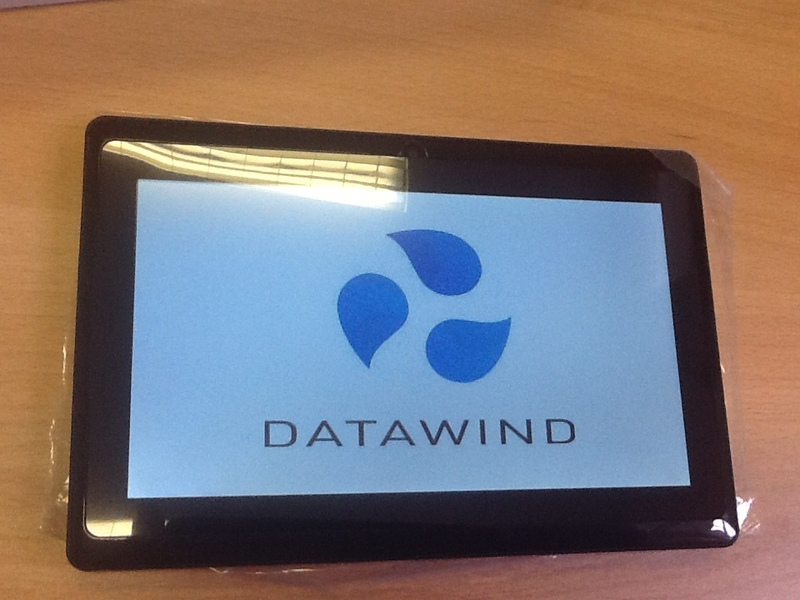 In 2012, a company called Datawind in India announced that they were going to produce a cheap tablet for the mass market. Not so cheap (so probably of some use). Initial reports were quite encouraging – here’s a great blog post from Ed Bullock/Nick Atkin at Halton Housing Trust on the test they carried out at Halton Housing Trust. Although obviously for the price they are not going to rival a top end tablet like the iPad in quality, power or usability, overall feedback has been encouraging. Fast forward several months, and as part of our drive towards being a digital first organisation and to help tackle digital inclusion, I thought I’d order a UbiSlate through work to see just how good they are. So here’s the story so far. 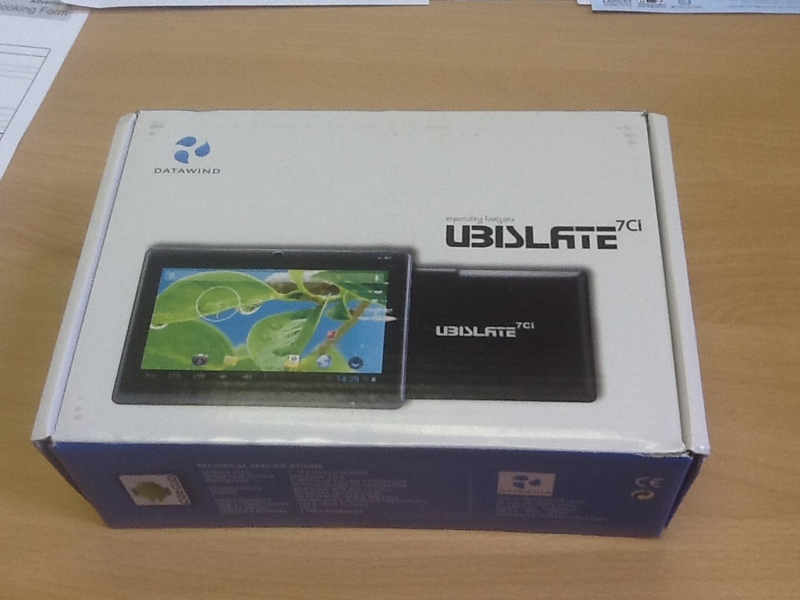 I ordered the UbiSlate 7ci through their website on the 6th May 2014. It was a standard (if anything rather easy) ordering system. The cost of the tablet was £30, but postage and packaging was a further £9.95, making the grand total of £39.95. I received the Emails back by return saying the order had been received. 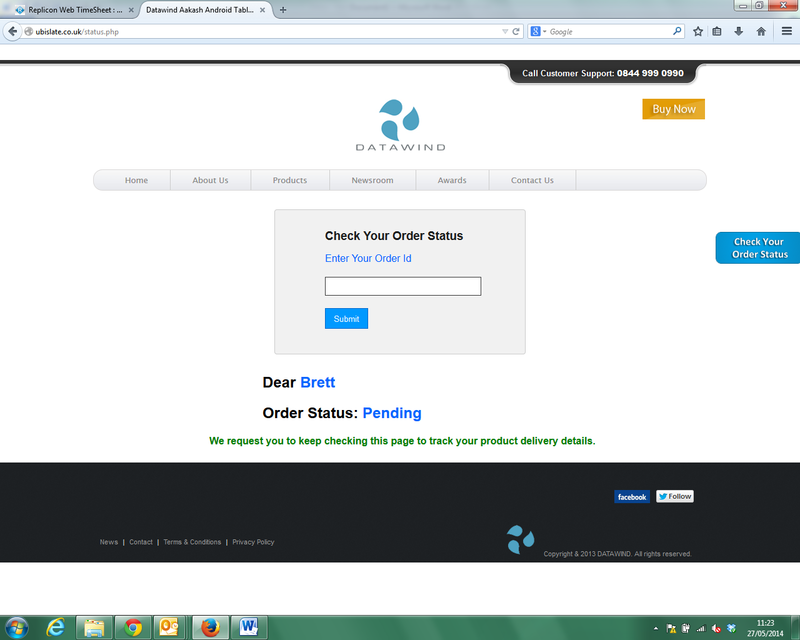 I dutifully checked their website a few times a week to be told that the order was ‘pending’ and to check back regularly. Then, out of the blue on the 27th May (the day after a bank holiday) I received my UbiSlate through the post. What was interesting was that I had checked that morning on their website and had been given their standard order ‘pending’ message, so it really was a nice surprise. So, to the UbiSlate. I carefully ripped open the packing (I was very excited) to find the box inside. On opening the box, I found very little packaging. The UbiSlate had a thin protective plastic sheet on the front and back, along with the charger and an instruction booklet. On getting the UbiSlate out of the box, I managed to accidentally turn it on. Then I proceeded to try and read the instructions quickly to check whether I needed to charge it first. The instructions said it needed 6-8 hours charging before use. I quickly plugged the charger in! It seems that the UbiSlate was already nearly charged, which was a nice surprise. I’ve no idea whether this is standard practice though. The tablet itself looks really nice. It doesn’t weigh too much, but feels sturdier than I expected. Not expensive feeling, but certainly not dirt cheap feeling either. I’ve had it sat on my desk for most of the last week and I’ve taken the opportunity to ask a few staff what they think. They seem to agree that it looks pretty good. Upon turning it on and it loading up with the Datawind logo (10 seconds or so), I was faced with a screen showing the time, along with a small lock image. With my finger I just moved the lock outside the circle and you are in. The initial screen looks a lot like the Samsung Galaxy tablet main screen. You’ve got the main 5 app icons along the bottom, one of which shows you the 46 apps already on the UbiSlate. Some of these you would just uninstall (as the UbiSlate was primarily made for Indian school age children, you probably won’t find a use for ‘Talking English’) and you can obviously add any apps you want as well. The tablet comes with two web browsers installed – the one at the bottom of the main screen just didn’t work for me, so I used the generic android browser. The first website I went on was google.com (had to be, didn’t it?) and I found that the google search box was just off the page. Turning the UbiSlate to portrait seemed to fix that. I’m sure more tekkie minded people would know instantly how to fix this, but I didn’t. The £30 tablet connects through Wifi and the experience of connecting to the internet was fine. No problems at all to report. I used the SlideMe to download a few apps. After putting in some basic logging details, it was pretty easy to find the apps and download them. I went for LinkedIn and Twitter, to give them a good test. Both worked well, downloaded quickly and although they looked different to what I’m used to, they were more than useable and easy to navigate. The tablet comes with a front facing camera, meaning you can take those all important #selfies. But it’s fair to say that the picture quality isn’t great. I read elsewhere that the picture quality reminded them of the quality you used to get on the first webcams that came on the market. Spot on description. That said, its better having the camera than not. It also potentially makes apps like Skype useable through the UbiSlate, although I haven’t tested that out as yet. As with a lot of lower end tablets, if you don’t turn the tablet off (just holding the top right button until it turns off), then it will drain itself of power over a few days. Thankfully it doesn’t take long to charge up from 0% to 100% – about 2½ hours. For 100% power use, you get anything from around 2 ½ hours to 3 hours battery life which if not bad at all. I’ve seen laptops with less. So, overall I’m pretty impressed by the UbiSlate 7ci. It’s not too heavy, fits in your hand nicely and really is pretty easy to use. It’s certainly a useable tablet which opens up some interesting options. One option is to give this to tenants who could easily save the £30+ cost on savings they gain through buying things through the internet or from the savings we as a landlord would get for a tenant contacting us digitally rather than by telephone or face-to-face. The other option is to give this for staff to use for some basic work functions. Both of these would obviously require some additional field research, but certainly seem worth exploring further. Of course, this would also require decent Wifi connectivity, or you’ll have to opt for the more expensive 7C+ version at £69.99. My initial thoughts are that you would want to take most of the pre-loaded apps off and put some specific ones on that tenants could use to contact the organisation, or ones to save them money. There is no reason why the content can’t be more targeted according to the audience. Also, let’s not forget the cost. This is really cheap for a tablet. People spend more than this on a lot of smartphones today and they are seen as an essential item for a lot of people. They would also make great options for digital inclusion training sessions for tenants, as they are so cheap. You could buy 10 or so of them and (as long as you have decent Wifi) get them used to using a tablet and surfing the web. Other options I’ve read elsewhere is to use them for showing video clips (for example on a reception desk) or as digital signboard outside meeting rooms. There certainly seems to be lots of possible options for the UbiSlate in the future. I’ll continue testing the UbiSlate through work and I think it’s highly likely we’ll look at getting some more of them to conduct some specific tests and projects. 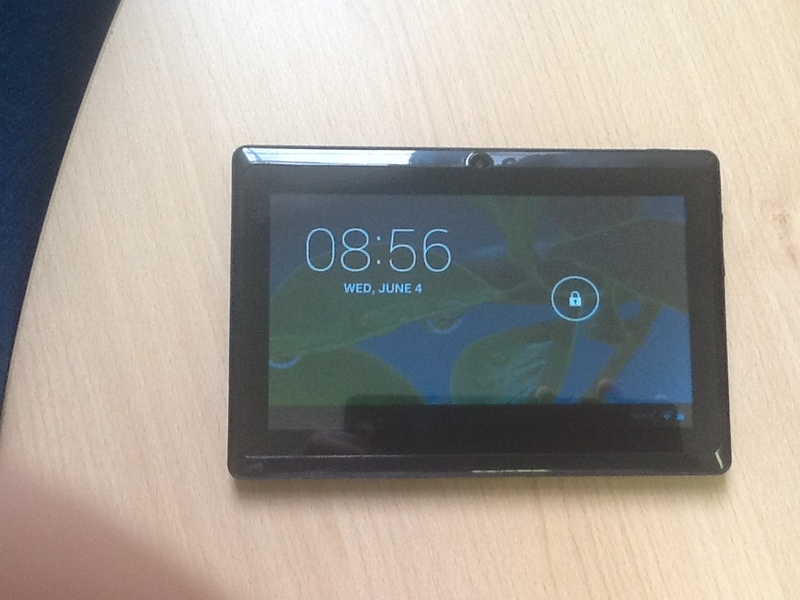 I have been given the UbiSlate tablet to trial before a potential pilot for our tenants. Without a doubt, this tablet is great value for money. The game changer? I think it could be. I have used the tablet over the last week or so for both business and pleasure. I easily accessed Amazon Apps, as I already have an Amazon account that saved a lot of time. I downloaded Facebook and Twitter in minutes. You need a good wi-fi connection to do this, of course. I went on to download games and upload some music to the device. Appearance wise, it looks good and feels good in your hands. The screen is receptive to touch, better than I had expected. When browsing the web, I was easily able to navigate around various pages. The screen zoom in and out options came in very useful and, seeing as it’s. £30 device, the quality isn’t too bad. Low points for me; The camera is of very poor quality and is only front facing. Additionally, the choice of apps and games is limited compared to Apple devices and Google Play Store. The speed, if you are used to using more powerful devices on a regular basis, isn’t great in comparison. Despite these, I think the tablets are incredible for the cost and as long as the user is in a wi-fi zone, they can connect to the World Wide Web and get involved in this digital revolution. Even if there’s no wifi, there’s still a game of solitaire to play to pass the time! Thanks for the comment Beki! The more of us that test the tablet (and hopefully see its benefits) the better. Looking forward to giving this to a few tenants to try in the coming weeks.